Stephen Leather is a prolific author, with 14 novels and another nine in the Spider Shepherd series. He has just penned another Spider Shepherd action thriller with the title True Colours (ISBN 978-1-444-73657-1, Hodder and Stoughton, 2014). The standout authors for me in the Thriller/Action genre are Stephen Leather, Christopher G Moore (Vinnie Calvino), Lee Childs (Jack Reacher) and Jake Needham. All of these authors possess the ability to see and record small details, such as describing the worn off paint on a set of stairs in a tenement building, and it is these details that make their characters so believable. They are also able to handle several plots and sub-plots and then bring them together at the end in a very credible way. True Colours does not deviate from this successful formula. Real people are included in the plot(s) to again give the book a sense of reality, rather than fiction. Abramovich, the Russian owner of the Chelsea Football Club and the poisoned former Russian spy Alexander Litvinenko being notable inclusions. 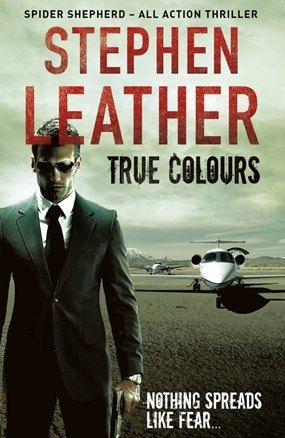 Leather has Spider Shepherd in Afghanistan, London, Cyprus and the author gives the reader an insight as to how mega-rich tycoons live, even to the point of having designers come to sketch the next private jet. A jet which will make the more usual Lear Jet look like a Toyota taxi. One unsolved problem was how to hang a chandelier in a plane! 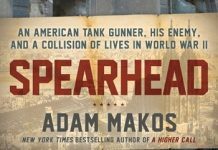 The book is set in today’s world and accurately describes the collapse of the Soviet era and the rise of the oligarchs. And an even more salient point, just ‘how’ the oligarchs managed to amass such fortunes. Leather’s Spider Shepherd is a killer with ethics, sounding initially as an oxymoron, but as you get further through the book, you can side with Spider Shepherd and understand where he is coming from. You also learn where his boss Charlotte Button is coming from, and it isn’t the same place. Spider gives the reader many points to ponder, but the one that impressed me most was, “Killing someone is easy, it’s getting away with it that’s difficult.” With modern detective aids such as DNA testing, the criminal element has to be very wary. BTW, Pattaya gets a cameo in the final few pages, when some of the ‘true colours’ come to the fore!